Storage, storage, storage, we never seem to have enough of it. Just when you think you are getting yourself organized, you turn around to find that you are not; at least that is how I feel. The problem is, good storage solutions are either hard to find, or they are expensive. So when I find a system that looks solid, and affordable, I feel it is my duty to share it with you. The ShelfLinks system from 2x4basics looks like it fits all of the criteria I mentioned above. The system uses a combination of heavy duty structural resin ShelfLinks in conjunction with a few user supplied 2x4's. The 2x4's make up the legs and shelf planks of the system, while the ShelfLinks hold it all together. The design has the 2x4's running through the ShelfLinks, which are screwed in place, so the weight of the shelves are evenly distributed down the legs to the floor. The cool thing about this system is that it can be adjusted to fit your needs. The depth is set by the 16-inch size of the ShelfLinks, but the width can be adjusted up to 8-feet. 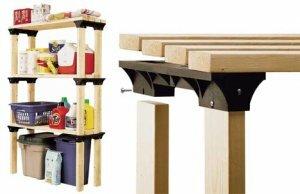 Each shelf is rated up to 1000 lbs, but this is likely to depend on the quality of the wood you use. The system is relatively inexpensive at $25 for 6 ShelfLinks, plus the cost of 2x4. So if you work in construction, you might be able to get a few jobsite leftovers, and save.